Hiring a car at Carcassonne Airport is a great way of exploring the Languedoc region. Search for a quote using our booking engine. Located close to here is a parking area for rented vehicles making pickup and dropoff a simple process. Once you are set up and ready to leave, you take the D119 road which gives you the option of heading for the city or to Pamiers. The city is just a short drive from the airport with usually little traffic to worry about. The official name of the airport is Carcassonne Salvaza International. It’s the entry stage for many Irish vacationers wishing to holiday within the Languedoc region in France. Its located to the north of the city. Road signs indicate “Salvaza”. Almost 450,000 passengers used the airport in 2017.The number of people using it has risen by 70% in the last 5 years. Some other possible transport choices at the airport include a shuttle bus service which runs 25 minutes after every flight arrival for just 7 euro. Tickets can be bought on the coach. There is a taxi rank just outside the airport terminal. It’s about a 10 minute drive to Carcassonne costing around 25 Euro. Travelers wishing to go to Toulouse might also wish to give consideration to flying into Carcassonne as it’s just a one hour drive away. You can pickup a car hire Perpignan Airport deal just 90 minutes away. You also have the option of a car rental Toulouse Airport deal which is just an hours drive away. There are lots of flight options provided by Ryanair with flights going from Shannon, Dublin and Cork. Using a rentacar service opens up a whole world of touring possibilities outside the town. Carcassonne is a gateway to the Languedoc region in France. Use our France car rental comparison service today and see how much you can save. The upper half of the town consists of the castle which is known as La Cité. 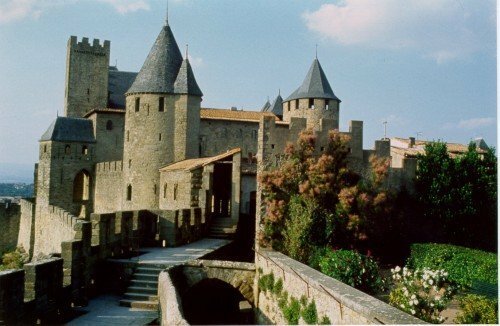 Historical buffs will love the medieval feel of Carcassonne. There are amazing viewing points here to observe the town from. The Basilica of Saint-Nazaire ought to be your very first port of call. It is located at Location de l’Eglis. There’s much to admire within the buildings beautiful carvings and stained glass windows. The Eagles of La Cité is a fascinating location to go to for children and adults. Here you are able to observe birds coached by trainers free of charge. Watch on as as the birds respond to each of their masters calls. Visitors cant help but be amazed. Carcassonne was named a UNESCO World Heritage site in 1997. Rennes le Chateau is a village within short driving range of Carcassonne. This region is believed to have been the home of Mary Magdalene as well as the location where the holy grail was hidden. If you’re one of the millions who was enthralled by the Da Vinci code, you will not want to miss this!